ImpBarn: Big Ends Wear Limit? What's the big end wear limit on a S7 de Luxe engine? Please don't say 3 thou. I saw someone quote the max allowable oil clearance on the big ends is between 1 and 2.5 thou. So I'm screwed if that's the case. 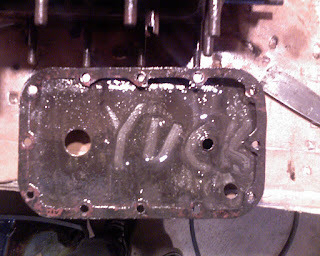 I'll need oversized bearing shells and the crank will need turned down. The pressure bypass check valve looks good. I tore into that, and saw that it was clear from blockages. There was something that looked like a hair in there, but it didn't seem to be up in the ball... just wrapped up in the spring. It seems to hold pressure in reverse, so I'm calling it good. Here's the follow up. With the crude vernier caliper I can get into the block with to measure the crank... it seems to be 25 thou smaller than stock. Which means the bearing shells are probably +20thou already. Which means I'll probably have to get a few thou taken off and go with +30 thou bearing shells. 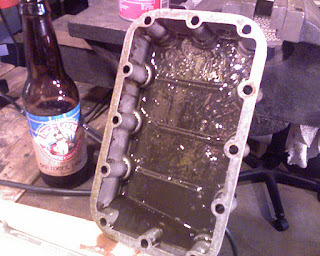 Until I get the flywheel, armature and timing cover off, I won't know about the rear main.